I had some left over berries begging to be used and cupcakes were on my mind and that’s how these Strawberry Meringue Cupcakes came about. Preheat the oven to 160 Celsius (320 Fahrenheit) and line a muffin pan with cupcake liners. In the bowl of an electric mixer fitted with the paddle attachment, cream the butter and sugar until light and fluffy. Reduce the mixer to low and add the eggs, 1 at a time, scraping down the bowl after each addition. In a separate bowl, or even better a jug, sift together the flour, baking powder, baking soda, and salt. In another jug measure out the milk and add the vanilla extract. With the mixer still on low alternately add the flour and milk and mix until just combined. Divide the batter between the 12 cupcake liners and bake for 15 to 20 minutes, or until the tops are golden and a cake tester comes out cleanly. Remove to a baking rack and cool completely before filling with the curd. To make the strawberry curd begin by placing the strawberries in the bowl of a food processor and pureeing until smooth. Strain the strawberries mixture into a jug through a fine mesh sieve to remove any pips. Place the egg, egg yolk and sugar in a saucepan and whisk until smooth. Add the butter, strawberry juice and place over a medium low heat. Whisk until thickened, this will take between 5 to 10 minutes. The mixture will be ready when you can see a slight trail from the whisk in the mixture. It will thicken further when refrigerated. 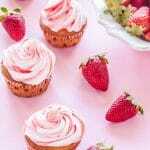 Cut a circle in the top of each cupcake and scoop out some of the cupcake from the center and fill with strawberry curd. Trim the circle you removed earlier and then replace on the cupcake. Repeat with each cupcake. To make the meringue topping, place a saucepan of water over a medium heat on the stove top and bring to a simmer. Place the bowl from your mixer over the heat and add the egg whites and sugar and whisk by hand until the sugar is dissolved. You can test this by rubbing the mixture between your fingers and if it's at all gritty keep whisking. Remove from the heat and attach the bowl to the stand mixer and whisk at a medium speed for 10 minutes, or until thick and glossy and stiff peaks form. Prepare a piping bag and paint stripes of the food colouring along the piping bag (you can use a small paint brush or cotton tip for this) and fill with the meringue mixture. Pipe the mixture on top of the cupcakes and bake in the oven for 5 to 7 minutes, or until lightly set on the outside. Alternatively use a hand held torch.